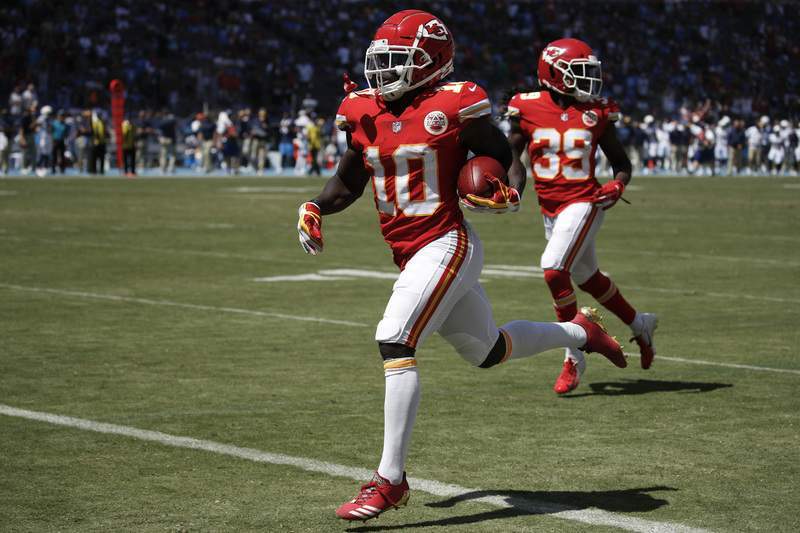 Associated Press Kansas City Chiefs wide receiver Tyreek Hill (10) scores against the Los Angeles Chargers during the first half of an NFL football game Sunday, in Carson, Calif.
CARSON, Calif. – Tyreek Hill scored three touchdowns, Patrick Mahomes passed for his first four NFL scores and the Kansas City Chiefs opened the season with a 38-28 victory over the Los Angeles Chargers on Sunday. Chargers: RT Joe Barksdale was carted off after injuring his right knee during the first quarter and did not return. He missed five games last season due to a turf toe injury.